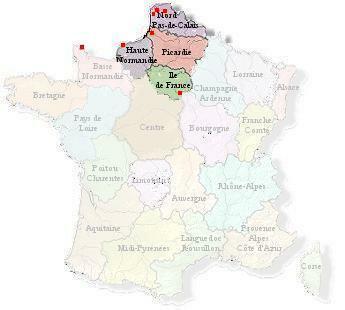 Abbeville branches in Picardie, and between the Abbeville, Ham and St. Omer branches. Pas-de-Calais, but no specific ancestor\descendant link has yet been found. and the United Sates descend from the Fécamp, Normandy branch. Illinois, Kansas and Oklahoma, CLICK HERE. To read my article about the French heritage of Oklahoma, CLICK HERE.